Shopbop Massive Sale! | The zealot of fashion. Hello beautifuls! Have you always been eyeing on that Alexander Wang get up or that cute Moschino bag? Now's your chance! Shop is one one of the biggest online concept stores with big clothing brands like BCBGMAXAZRIA, Acne Studios, Rag & Bone, Maison Martin Margiela, 3.1 Philip Lim, Carven, Donna Karen New York, DSQUARED2, Elizabeth and James, Gareth Pugh, Helmut Lang, J.W. Anderson, Jean Paul Gaultier, RED Valentino and the lists goes on and on. You'll also be able to find your favourite bags, shoes accessories brands such as MCM, DvF, Giuseppe Zanotti, House of Harlow 1960, Jeffrey Campbell, Miista, Y-3, Rebecca Minkoff and more! 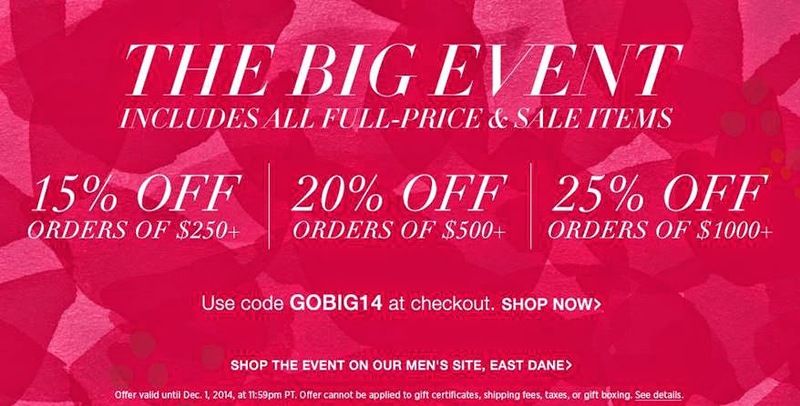 Just don't forget to key in the code "GOBIG14" at check out and this applies to all full-priced and sales items too! Valid until December 1st, 2014, at 11:59pm PT. GO SHOP NOW!